← Cat lost for 10 years was living with a neighbour! Lost cat poster with $10k reward. This is USD! I think US$10,000 is the biggest reward that I have seen for finding a lost cat companion. 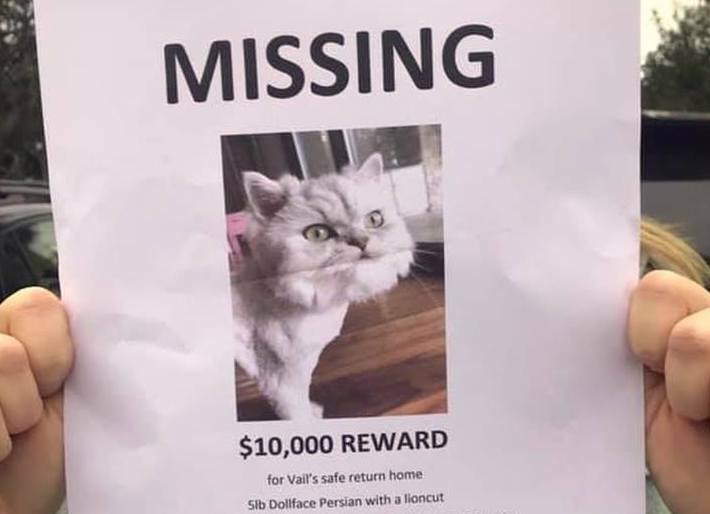 The last cat flyer read: “$10,000 reward for Vail’s safe return home”. I offered £500 when my cat was lost which is a fraction of this reward. The cat in question is a Doll Face Persian. This is the traditional person and she is owned by a family on Sullivan’s Island, South Carolina, United States. The cat’s owner wants to keep her name private but her first name is Lindsey. She said that Vail became spooked and ran off. She said that her cat jumped out of her arms. They were concerned because it is the first time that their cat has been out of the house. Vail turned up on the steps of Sullivan’s Island Elementary School where a teacher saw her. The teacher looked after the cat and made contact with Lindsey. We are told that at first the teacher was reluctant to claim the reward but did so later. A wise decision. The size of the reward caused a bit of a buzz on social media. It seems that Vail was found quite quickly because we are told that the owner’s family were out looking for her for about two days before she was found. Vail has lived with the family since she was born. The family don’t regret the size of the reward but I think they should. They may well have found their cat within a relatively short space of time bearing in mind she was at the local school and in plain sight. They took her to the veterinarian for a checkup but all seems well. This entry was posted in lost cat and tagged ailurophile, lost cat, reward by Michael Broad. Bookmark the permalink.